It was a retirement like none other! The first hint of an event for the history books were the miniature American flags handed to everyone as they filled their seats on Friday night. The second hint was when the in-gate opened. 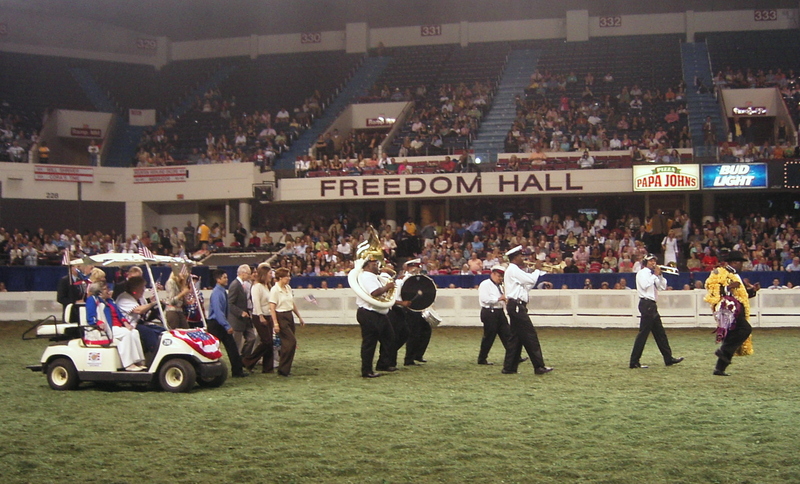 The Mahogany Brass Band burst forth playing “Lil’ Liza Jane” to an up tempo with Delfeayo Marsalis dancing and leading the way for all of CH Americana’s Jazz Man’s entourage entering the ring. Marsalis, brother to Winton and Branford, was a sight to see. Wearing his own blanket of yellow roses draped over one shoulder and twirling an extravagant Parisian-style umbrella, Marsalis and his New Orleans-based Dixieland band captivated the crowd. Some retirements are understandably sad and require an ample supply of hankies. Not so for Jazz Man! This retirement was happy, lively and just plain fun! Once attendees were gathered in center ring, all eyes were on the in-gate once more. The guest of honor – CH Americana’s Jazz Man – and his beloved Philippa Sledge arrived with all the style and energy worthy of a stake night performance. After making numerous passes around the ring, the pair stopped near the gate-end of the ring. Flanked by trainers Bob and Sarah Byers, they watched the overhead monitor along with everyone else as past and current trainers reminisced on video about this great horse and his rider. In keeping with the upbeat mood of the evening, a blanket of red, white, and blue roses was then draped over Jazz Man’s withers with Philippa still mounted. After a couple of last passes of the ring, they left with a grand flourish and to the strains of the Mahogany Brass Band playing “When The Saints Go Marching In,” with the crowd, in a standing ovation, cheering loudly. The party continued in splendid fashion after the show. A sumptuous Cajun buffet was enjoyed by (it seemed) every person on the show grounds. The Mahogany Brass Band continued to play to the crowd’s delight, with Marsalis dancing with several ladies from ages eight to eighty. It was certainly a night to remember! Ladies and gentlemen, we come now to the retirement of one of the most accomplished three-gaited horses in the show ring. If your name is Americana’s Jazz Man, you’re all about jazz. Please welcome—all the way from New Orleans, Louisiana, the home of American jazz—Delfeayo Marsalis and the Mahogany Brass Band. And now, ladies and gentlemen … he has more than 50 blue ribbons to his credit … and this is his last appearance at Freedom Hall. Please welcome—Champion Americana’s Jazz Man and Phillipa Sledge! Ladies and gentlemen, you can see the extraordinary partnership between Americana’s Jazz Man and Phillipa Sledge. For a little background on how they have come to mean so much to each other, please direct your attention to the monitor overhead. Phillipa Sledge: I have to say, of all the horses I’ve ever ridden, the minute I got on Jazz Man, there was an instant bonding. It was an instantaneous connection. I knew this was the horse. Announcer: Americana’s Jazz Man was born in 1987 and started his show ring career as a juvenile horse. But it wasn’t until he was eight, and he came to trainer John Wallen, that he began to come into his own. John Wallen After I got to working him, I got to see the talent that this horse had. He knew how to do it. What I liked about him was his ability as far as he was the type of horse, you never stepped on the gas pedal; you just touched the gas pedal. Announcer: A year later, Jazz Man was sold to Dodie Stockton at Bob Gatlin’s barn—and right after his World’s Championship in the Three-Gaited Under Two class with Bob, he was sold again … this time to Harris Stables, for the Sledge family of Pidgeon Roost Farm. Don Harris: To me, he goes like a walk/trot horse is supposed to go—a park trot, never drops an ear. I was crazy about him. Announcer: Don showed Americana’s Jazz Man, but the gelding was always slated to be Phillipa Sledge’s amateur horse. 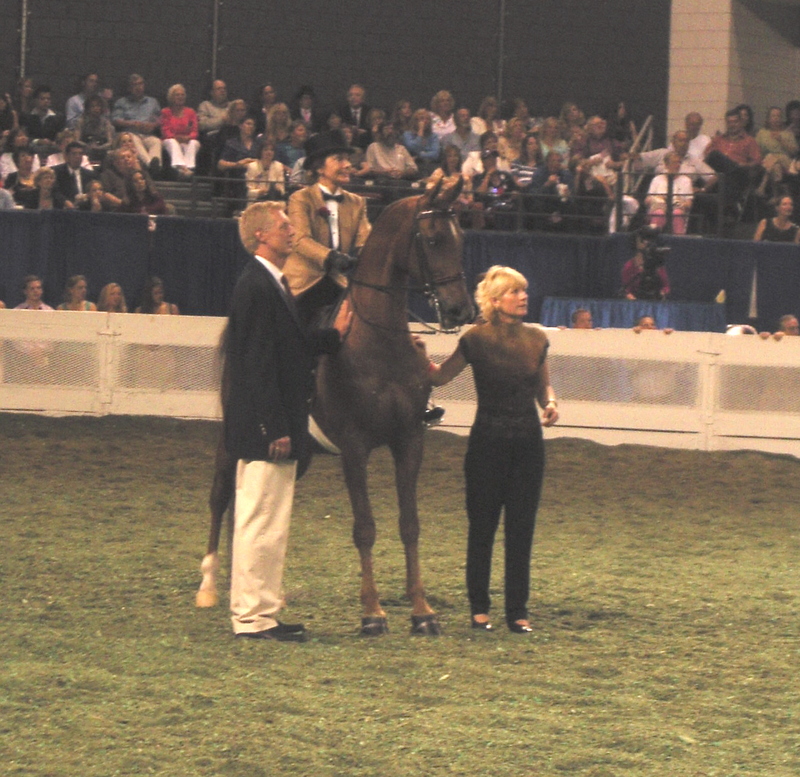 Stan Harris was the trainer in 2000, when Jazz Man and Phillipa, in their initial Freedom Hall appearance together, won their first World’s Championship. Stan Harris: The first night that Phillipa won at Louisville in that Amateur Under 2 class, her first World’s Championship and my first, I almost broke down in tears right there on the rail. It meant more for her than it did for me; I was thinking of her. Phillipa Sledge: The moment when they called my name out, it was almost like I left earth, and so did Jazz Man. Announcer: For Phillipa, who had been working hard on her riding skills at Premier Stables just to be good enough for Jazz Man, it was a dream come true. Phillipa Sledge: When I rode up to get the ribbon, it was just me and Jazz Man, flying around the ring. Announcer: Jazz Man eventually moved to Premier Stables, where Phillipa continued to hone her talent with Sarah Byers. Sarah Byers: Their presence and personality, to me, just always suited each other. They were just the perfect little miniature package of a great walk/trot horse and a wonderful rider. He always hits the ring like he owns it, and Phillipa has learned to ride him that way. I think that’s what has made them be so special. Rob Byers: Jazz Man has the biggest heart in the world in a little bitty body, and all of that heart is trying to bust through. All of that energy is trying to bust out of that skin and that little body, and it just comes across as the best show horse one could ever know. Don Harris: He stacks right up there with Starina and Gift of Love. The kind of horses I’ve had, I’d have to put him in that category. He just goes on and on, and he’ll probably, when he makes this retirement thing tonight, he may be the best walk/trot horse on the grounds. Now, as the photographers take their pictures, let me introduce those who are here with Jazz Man tonight. Please welcome Phillipa’s mother, Mary Jane Sledge, who last year was inducted into the World’s Championship Horse Show Hall of Fame, recognizing her lifelong contribution to this breed. And their friend of a lifetime, Dorothy Dutel. Also present are Nell Puls, Phillipa’s sister, her husband Jack, and her daughter, Mary Nell Betancourt. Please welcome also the trainers who guided the career of this amazing gelding: John Wallen … Don Harris … Stan Harris, who trained Jazz Man to his first Amateur World’s Championship … Casey Marcos, once a member of the Harris team … and Rob and Sarah Byers, who have helped Phillipa and Jazz Man become the team that they are. Also present are Ashley Isenhower of Premier Stables, and Jorge “George” Rodriguez, Jazz Man’s beloved caretaker of the past five years. As Jazz Man prepares to return to the rail, it is worth mentioning that to the best of our knowledge, he is the oldest horse ever to win a World’s Championship in one of the three main disciplines of American Saddlebred competition. He did that right here in Freedom Hall last year—at the age of 17, when he and Phillipa were named World’s Champions in Three-Gaited Amateur Under 15.2 for the third time in their career together. He is, truly, a veteran of the ring and a valued companion for those who have been privileged to be a part of his life. In New Orleans, they have a saying … Phillipa Sledge figures that Jazz Man thought about it every time they headed for the ring. And so for one last time tonight, we ask that you raise your flag in a salute to Jazz Man—and remember his philosophy: Laissez le bon temps roulez … Let the good times roll!